Posted on Thursday, July 7th, 2011 at 7:30 am. We, here at Blogpaws, give a HUGE paws and thumbs-up to our friend Emmy. 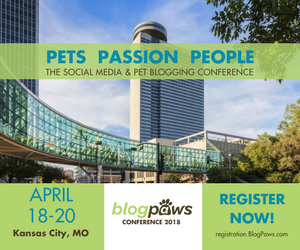 She's offered fantastic information for anyone who is heading to the Blogpaws Conference. Woofs, wags and meows to you Emmy the Pet Sitter! I’m a pet sitter who has lived in the D.C. area since 1963, and wanted to say "Hah, ya'll!" (even we Northern Virginians can have a twang). It's breaking my heart that I can't come to BlogPaws 2011. But I wanted to tell you a few things about the area. The D.C. area is infamous for heavy traffic, but it eases off a bit in August. Nevertheless, if you rent a car, allow more time than you think you need. The Sheraton Premiere at Tysons Corner is on Leesburg Pike/Route 7 near the Dulles Toll Road/Route 267. In the “You can’t miss it” category, construction of the Dulles Corridor Metrorail Project fills the median of Route 7 between the Dulles Toll Road and Chain Bridge Road/123. (The Sheraton itself is a quiet, green oasis in the midst of the chaos.) In addition, Route 7 is a major east-west corridor for commuters. You're about a mile from the Beltway/495, an interstate that circles the city; it's busy any time of day. Expect bumper-to-bumper traffic during rush hour. If you plan an outing, you may want to get traffic updates before you go, then ask your hotel concierge if any problems will affect you. @drgridlock on Twitter reports on incidents. You can also try ABC7 Traffic Tools or WTOP online. In the car I listen to WTOP 103.5 FM, which reports on traffic “on the 8s” (1:08, 1:18, 1:28, etc.). The Sheraton web site lists ways to get around by car, hotel shuttle, and Metro. Once you're here, your hotel concierge can give you the best advice. August in Washington, D.C., can be unbearably hot and humid, or just plain hot. You can check local weather before you travel via local TV stations. I plan to blog about places to shop, places to eat, and resources for pets. What do you want to know? If you have questions or want more info please contact me. One thing you forgot to mention was that the British once considered DC a tropical post. Great post, Emmy! As a DC-er myself, I am glad to see you are giving people this info – especially about our epic traffic. Another thing to be wary of right now are the road closures in the Tyson’s area for the metro construction. Sometimes the Dulles Toll Rd or I-66 are closed, and there are sometimes detours or other closures in Tyson’s too.